A magnitude 5.8 earthquake struck in Virginia on Tuesday afternoon, with tremors felt as far away as New York City, Washington D.C., North Carolina and Ohio, CNN and the USGS report. 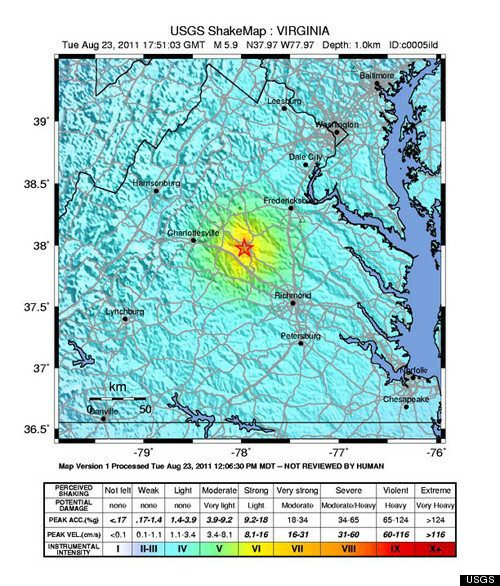 The Associated Press reports that the epicenter was in Mineral, Va., northwest of Richmond, and was 3.7 miles deep. No injuries have have been reported, according to the Associated Press. WABC-TV reported on its Twitter feed that as a precaution, the control towers at John F. Kennedy International Airport and at Newark Liberty International Airport were evacuated. According to Reuters, the Port Authority is reporting that as of 3:03 P.M. EST, flights at both airports have resumed. In a statement, the Federal Emergency Management Agency (FEMA) asked that people use text messages rather than make phone calls as cellular networks in Washington, D.C. and New York are reportedly congested. The State Office of Emergency Management continues to monitor effects in New York State from the earthquake that originated in Virginia this afternoon. Currently, there have been no reports of damage to buildings, bridges, roads, power grids, the Indian Point nuclear power plant, or other infrastructure. In March, Gov. Cuomo called for Indian Point to be closed after a report from the Union of Concerned Scientists said the plant had engineering vulnerabilities. Indian Point is about 24 miles north of The Bronx. New York Mayor Michael R. Bloomberg said in a statement that "there are no reports of significant damage or injuries in New York City at this time." "Like people up and down the East Coast, New Yorkers across the five boroughs felt the effect of this afternoon’s earthquake in Virginia. I’ve spoken with our Police and Fire Commissioners, and we’ve activated the Office of Emergency Management’s Situation Room and spoken to other city agencies, including the Department of Buildings. Thankfully, there are no reports of significant damage or injuries in New York City at this time. As ever, we urge New Yorkers to call 911 only in cases of actual emergencies." "Shortly before 2:00 PM, we evacuated City Hall briefly, but quickly returned to work. As we await more news from Virginia and elsewhere, our thoughts in New York are with those who were more directly affected by this natural disaster." There was a partial chimney collapse at one of the buildings in the Red Hook West Houses, a public housing development in Brooklyn, the mayor said at a press conference on Tuesday afternoon. There were no injuries reported, and the building was deemed safe for re-entry after the city's engineers inspected it. Mayor Bloomberg also said that the subway did not experience any delays. He also reported a large spike in calls to 311 and 911 directly following the tremor. Cy Vance, the Manhattan district attorney, was interrupted while he was giving a press conference about the Dominique Strauss Kahn case. In February, Won-Young Kim, a seismologist at Columbia University, said that New York City is long overdue for an earthquake. Earthquakes New York Washington, D.C.